The deadline is fast approaching if you plan to submit data for the 2017 Merit-based Incentive Payment System (MIPS) performance period to CMS. Eligible clinicians must submit before March 31, 2018, to avoid the negative payment adjustment for each claim beginning January 1, 2019. YOU ARE STRONGLY ENCOURAGED TO SUBMIT YOUR DATA PRIOR TO THE DEADLINE. There is no reason to accept a 4% decrease in Medicare reimbursement in 2019. Now is the time to act. MIPS Test Data Submission is easy, free and you have access to free assistance from the atom Alliance Quality Improvement Organization (QIO) and Qsource. Not sure if you are required to participate in the MIPS? Click here to link to the MIPS Eligibility Tool and enter your NPI. It’s that easy. If you still have questions or want to learn how you can report your MIPS data free of charge, don’t delay. Call 1-844-205-5540 or e-mail techassist@qsource.org. MIPS Test Data Submission is easy, intuitive and you have access to free assistance. There is no reason to accept a 4% decrease in Medicare reimbursement in 2019. Using the QPP Navigator, simply enter your practice information and fill in the numbers for just one measure. The QPP Navigator has everything you need to avoid the MIPS pay cuts and is provided at no charge. It is secure, risk free, and provides 24 hour friendly support. Don’t delay! Call us now at 844-205-5540 or email us at techassist@qsource.org to learn more about how to avoid the penalties. Today, the Centers for Medicare & Medicaid Services (CMS) launched a new data submission system for clinicians participating in the Quality Payment Program. Clinicians can now submit all of their 2017 Merit-based Incentive Payment System (MIPS) data through one platform on the qpp.cms.gov website. Data can be submitted and updated any time from January 2, 2018 to March 31, 2018, with the exception of CMS Web Interface users who will have a different timeframe to report quality data from January 22, 2018 to March 16, 2018. Clinicians are encouraged to log-in early to familiarize themselves with the system. To make it easier for clinicians to search and find information on the Quality Payment Program, CMS has moved its library of resources to CMS.gov. On this website, clinicians will be able to more easily search for Quality Payment Program resources. The Resource library includes fact sheets, user guides, and other materials to help clinicians successfully participate in the Merit-based Incentive Payment System (MIPS) and Advanced Alternative Payment Models (APMs) in 2017. The Quality Payment Program has free resources to help.  Visit the official CMS website at qpp.cms.gov. You may have heard that the Centers for Medicare & Medicaid Services (CMS) is reviewing claims and letting practices know which clinicians should take part in the Merit-based Incentive Payment System (MIPS). 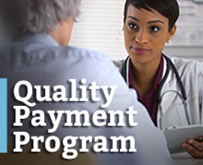 MIPS is an important part of the new Quality Payment Program.  Find new ways to engage patients, families, and caregivers.  Improve care coordination and population health management. During this first year as we move to the Quality Payment Program, CMS is committed to working hard with clinicians to make the reporting and participation process easier. It’s CMS’ priority to further reduce burdensome requirements so that clinicians can deliver the best possible care to patients. 1) You visit qpp.cms.gov, click on the MIPS Participation Look-up Tool, and use your National Provider Identifier (NPI) to check your status. Also, you may have recently gotten a letter from your Medicare Administrative Contractor (MAC) that tells if you’re included in MIPS. Your practice should have received a letter that includes the MIPS participation status of each clinician associated with the practice’s Taxpayer Identification Number (TIN). 3) You’re a MIPS eligible clinician that bills $30,000 or more in Medicare Part B allowed charges a year AND provides care to more than 100 Part B-enrolled Medicare beneficiaries a year. If you did both and you’re part of MIPS for the 2017 transition year. In other words, you go beyond the “low-volume threshold.” CMS determined billing and patient volume by using claims data from September 1, 2015 through August 31, 2016. CMS will identify additional low-volume clinicians using claims data from September 1, 2016 through August 31, 2017. 4) You’re not new to Medicare in 2017. If you’re new in 2017, you’re not part of MIPS. 5) Your practice tells you the group you’re a part of is participating. Each practice should let its clinicians know their MIPS status. If you practice under more than one TIN, you’ll hear about your status for each TIN. Your status can be different across TINs. For example, you might be part of two practices with different TINs. Your Medicare billing and patient count might be more than the low-volume threshold at one practice, but not at the other practice. 6) Your practice chooses to participate in MIPS as a group. If your group does choose to participate, you’ll be assessed and scored as a group. 7) You didn’t participate sufficiently in Advanced Alternative Payment Models (APMs) and become a Qualifying APM Participant (QP). If you did, you’re exempt from participating in MIPS. If you’re in an Advanced APM and become a Partial QP, you may choose whether to report on MIPS measures and activities, be scored using the APM scoring standard, and be subject to a MIPS payment adjustment. Partial QPs can choose not to participate in MIPS, but they still have to meet the participation requirements of their APMs. 8) You want to participate. Even if you don’t have to participate in the MIPS program you can still choose to participate. If you do, you won’t be subject to MIPS payment adjustments.